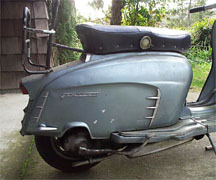 I recently found an old Lambretta for sale in Southern California. Although not running, the bike was complete apart from a few badges on the legshield - even the keys were included. I found the bike online through Scooter Parts Direct who were selling it for a great price since it didn't run. Shipping from Santa Ana to the Bay Area would have been $250 so instead, I rented a Ford Ranger pickup from Budget for only $19.95 a day, which gave me an excuse to visit friends down south. 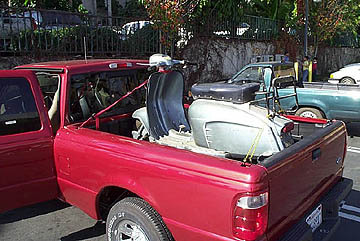 The truck comes with a fiberglass top to the bed, presumably so you can not haul trash, furniture, or scooters. What Budget probably doesn't want everyone to know, is that this top comes off with 6 Torx bolts and a T-45 Torx driver, making a perfect scooter hauler. The bodywork was in especially good condition with only small scratches and small dents visible. 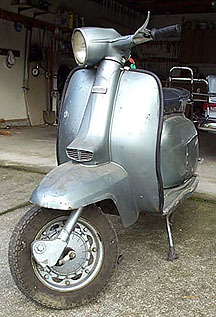 This bike was never imported to the USA and has the same basic bodywork as an early TV175 or a Li150 Special (see below). The engine is similar to a GP125 but with a Li style crank (I think... we'll have to see once I take it apart). So far the engine has spark, but very little compression. I'll clean out the fuel system, and probably re-bore the cylinder so I can get it back on the road soon. Eventually, I plan to make a fast bike with full bodywork. 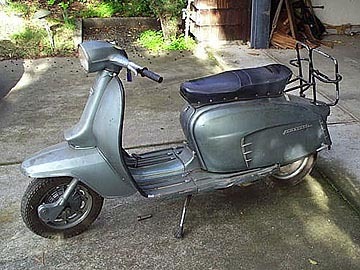 I have always wanted a fast Lambretta and I plan to either upgrade using the existing casings to an Imola 185 kit or replace the casings and add a TSI 225 kit. The gearbox on this bike is the same as a GP200, with the exception of a lower primary, so I believe I can rebuild it into 200 casings and change the primary ratio. 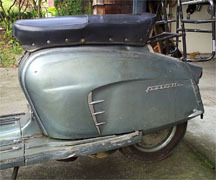 The bodywork will remain the same to keep the classic lines of the bike. As I save money for the kits and do more work on this bike, I'll update this section.